We’d love your help. 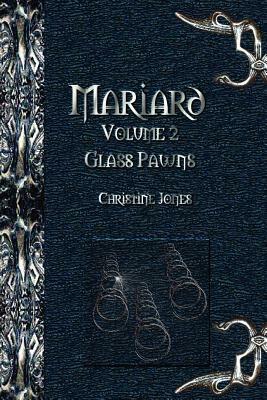 Let us know what’s wrong with this preview of Mariard Glass Pawns by Christine Jones. To ask other readers questions about Mariard Glass Pawns, please sign up. War is fought not only on the field, but also within the mind. Nothing is what it seems, take nothing for granted. The gifted are fighting for you. Do you have the right to become an entity? Take the challenge and go with them through their trials and tribulations, whilst tapping into the unfolding universal truth. Christine Jones has created a masterpiece, a journey beyond imagination. The mind is a locked door; she opens it to a greater knowledge War is fought not only on the field, but also within the mind. Christine Jones has created a masterpiece, a journey beyond imagination. The mind is a locked door; she opens it to a greater knowledge and awareness. Are the Mariard Volumes fantasy or reality? From illiterate to author, a thirty year journey. Australian author, Christine Jones writes for the love of storytelling and self-growth. I grew up with a creative father, who amazed, amused and intrigued me with stories from his past. My love of writing came from wanting to escape my problems and silently express my feelings and thoughts in what I thought a less painful way. Through family and man From illiterate to author, a thirty year journey. Australian author, Christine Jones writes for the love of storytelling and self-growth. I grew up with a creative father, who amazed, amused and intrigued me with stories from his past. My love of writing came from wanting to escape my problems and silently express my feelings and thoughts in what I thought a less painful way. Through family and many other writers helping and encouraging me, I finally was able to move from illiterate to author and get my works published. Gone are the 500 word sentences and I can now tell the difference between their and there, I owe that one and many other similar words to my daughter’s persistence. Considering what I have experienced during my life, either personally or through others, I found myself going on a journey of enlightenment with the characters in the books. Seeing different perspectives also enabled me to grow as a person with each volume being more challenging to my own self-worth issues. I have written 7 of the 10 volumes and plan in the future to write the Mariard diaries, personal accounts from the characters, revealing times not mentioned in the volumes.